The mail boxes. So many mail boxes. As a little girl I was always amazed by how many mail boxes there was. The cool kind too. The ones that lined the wall from top to bottom. You even needed a key to open them. So much more impressive then the single mail box that stood outside of houses, all by them selves, with a single red flag to let the mailman know there was mail to be taken. There was always a distinct scent. Not a bad kind of scent, mind you. Yet, not exactly the scent of freshly baked chocolate chip cookies. Just a simple kind of scent that went along with the endless walls of mailboxes, and followed us to the elevator. It seemed like we were on the elevator for such a long time. I loved it, only because I knew what was waiting for us at our destination. As the elevator doors would open, we would follow the hallway, all the way down, last door on the left. That is where memories would be made. As soon as we walked in, we were welcomed into their living room. A fairly nice size. There was also a small hallway. The bathroom was on the right. The boys’ room was straight ahead, and their bedroom was on the left. I do not remember any carpet in the hallway or bedrooms. Just the same kind of flooring that you would seen in classrooms back then. Now a days the classrooms have carpet. Back to the living room. The sofa. The white floral sofa that may or may not have had plastic on it, was pushed back to the wall. There was also a recliner of sorts. He always sat on the recliner. 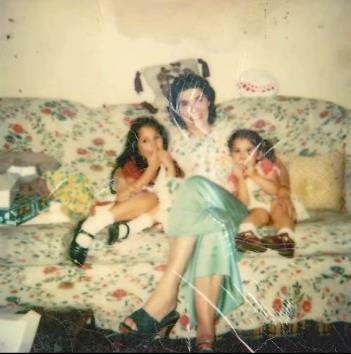 We always sat on the sofa, and She was always in between us, making sure to not play favorites. So many pillows. I always loved the pillows on the sofa. I even had a favorite. It was purple. A dark violet purple, over a white/grey background. There were four tassels on each corner. Sometimes I would try to braid the tassels, but back then I did not know how to braid. If you were sitting on the right side of the sofa, straight ahead would be the table. It was such a big table. The best part of this table, the location. They had it in front of a very large, perhaps wall length window. I loved looking out this window, but only if I was at the table. It had the best view of the New York City streets. Sure, the window in the living room and both bedrooms had the view of the Statue of Liberty, and the Hudson River. Many many years later He would be watching 9-11 happen from this very window. However, my personal favorite was the view of the New York City Streets. I loved looking down, from so very high up, and seeing all the car lights, usually stuck in traffic, the sky scrappers shining bright, wondering where people were going and what they were doing. Even back then I wanted to be in everyone’s business. Then there was the kitchen. If you are standing near the sofa, looking straight ahead to the table, the kitchen in on the left. Oh how I loved the kitchen. It was small, and cramped, and just about perfect. I was amazed how She had her coffee cups. They were hanging on a hook under the cabinets. It was magical. I loved this place. This was the beginning of my Christmas memories, and, come to find out, this would be the place that I would always visit in my dreams once they were gone. One time, I asked Her to close her eyes. Of course She did. There was nothing She would not do if we asked. I put a Spanish peanut in her mouth with the skin still on. I thought I was being cute and funny. She thought I was being cute and funny. She made a “yucky” type face and spit the peanut out, He got mad. Not in a mean kind of way. Even then, I knew He wanted to make sure she was okay. She was. Out of His ear shot She made a funny joke to me about not paying attention to Him. So I didn’t. Then there was the time when my uncle, decked out in black lace up boots, beige pants tucked into his boots, a white pirate shirt that many years later we would see on Seinfeld, and possibly a beret, came into the living room. I was sitting on the floor playing with my new baby carriage. He sat on the sofa and played Queen’s We Will Rock You, on their record player. That was the first time I had heard Queen, but not the last. It was just my dad, myself, and Him. I do not remember where everyone else was. We were sitting at the table. I was at the head (of course.) My dad and Him were to my left. He brought me a plate of graham crackers. The full size kind where you had to break them up. I took the plate and put it in front of me. While drinking my juice I started to break up the graham crackers. He asked if I was going to save some for everyone else. I felt like a dork, even though I had no idea where everyone else was. He would always sing that with us. Okay, let me clarify, we would make Him sing with us. He always got up there, and did the motions. Of course he messed up, of course he did not always know the words, but that was part of the fun. She always cooked so much food. So much good food. So many people. So much sauce, and pasta. Presents, the Christmas tree. Tinsel, and colored lights, my favorite. Frank Sinatra. The self portrait of her, the cross hanging above their bed. The bathroom, I loved the tile in the bathroom. Saying good-bye. I hated saying good-bye. She would always walk us all the way down to the elevator. He would stay behind. I do not think he liked saying good-bye. I never liked saying good-bye. I was always left wondering when I would see them again. A year is a long time for a little girl. Now a days, not so much.